Jalandhar: A group of Sikh activists on Sunday refused to allow Indian deputy high commissioner to the UK Charanjeet Singh to use the stage of a Gurdwara Sahib in Shepherd Bush area of London. The diplomat had an argument in the Gurdwara Sahib complex with the activists who told him that he would not be allowed to speak from the gurdwara stage but he we free to pay obeisance to Guru Granth Sahib in his individual capacity. The Indian diplomat however did not agree to limit his visit to paying obeisance and returned after the argument without going inside to pay obeisance. It is notable that the Sikh Gurdwara Sahibs in the US, Canada, UK, various European countries and Australia have announced to not to allow Indian officials to use Gurdwara stages. These gurdwaras had made it clear that the Indian officials would be allowed to visit the gurdwaras in personal capacity to pay obeisance. A video of the incident was uploaded online by the National Sikh Youth Federation UK, an organization of Sikh youth activists. The deputy high commissioner, who is from Punjab, had gone to the Gurdwara Sahib on the occasion of the 549th Parkash Gurpurab of Guru Nanak Ji and had made it clear that he was there in his official capacity and intended to address the Sikh Sangat. When a Sikh youth activist raised Human rights violation issue, another Indian official who was accompanying India’s Deputy High Commissioner said that talk can’t be held like this and the Sikh activists should come to the Indian High Commission. But on the other hand the Indian diplomat kept insisting that to use the Gurdwara stage and address the Sikh sangat. “If I can’t talk to my brothers I can go back. I am here in my official capacity. I shall congratulate but if you will not let me speak then I shall go back,” he said. The Sikh activists clearly told him that he could pay obeisance to Guru Granth Sahib and could have langar but would not be allowed to address from the gurdwara stage. They also raised the issues of 1984 Sikh Genocide and human rights violations in India. 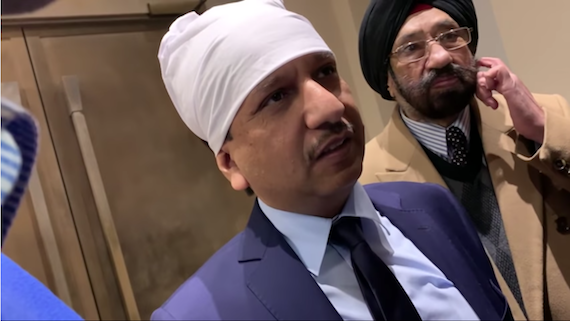 The Indian official who was saying that he was also a Sikh preferred to act as Indian representative and left the Gurdwara Sahib without paying obeisance on which there was no restriction.